Minor Bug Fixes, Certificate issues for Push Notifications. Multipage Option (InApp purchase) – Now you can add as many pages as desired! Letterhead Option Added – Add a Logo and/or a full screen letterhead. New! Export/Import function for other Pocket Letter users. File is exported as a .plpd file extension. New! Clear Button on Main Text section. Handy for cloned/duplicated letters. It allows you to clear the body of the letter and retains the To/From, Salutation and Closing sections. Need a Meeting Agenda App? 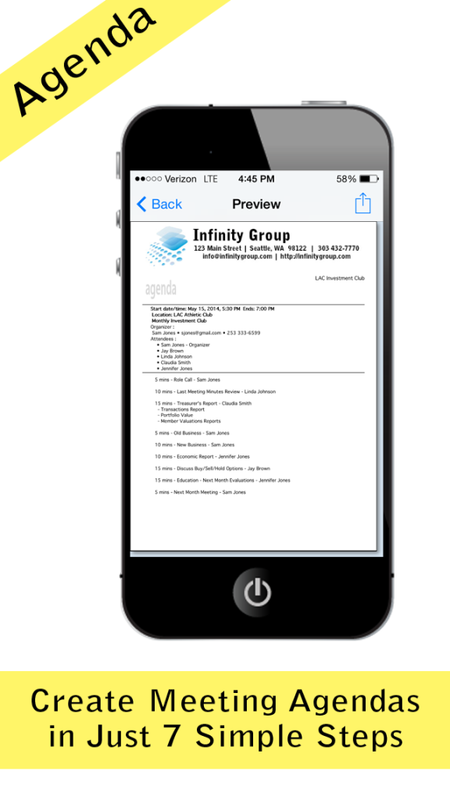 Try Pocket Agenda Lite for your next meeting. If you’ve tried using Pocket Letter to create meeting agendas, you might be interested in our app called Pocket Agenda! Keep your meetings organized, on time and on topic. Added the following to the About Page (click the “(i)” button). Lines Remaining in Main input text screen. Overview Screen – Added Clear button when editing file name field. Main Text entry – When clicking between subject and main input, main text input now resizes for full screen size. (For Lite Users with Ads: Click Done and in the main text area for full screen). Specify Paper Sizes for Printing (Pro). Page Preview Size adjusts per paper size selected. Options are US Letter, US Letter Edge to Edge (Default for all Countries), A4. Default can be changed in “settings”. Push Notifications for updates and important information. Removed horizontal line below business header. Bug fixes: Lines remaining, various text display issues, exiting app after preview. New “Me” button in Letterhead, to save/load your information for letters. Logo – now allows 2x resolution; scales and sizes to fit properly (Pro). Closing image – now allows 2x resolution; scales and sizes to fit properly (Pro). Both logo and closing image now size properly, and offer editing capability (Pro). Body text can now start with blank lines (just a return). Address Field – commas should place properly. Email address and single telephone or no telephone, place and space properly. Support email form now includes your device info.